The Moon and Jupiter shine through holes in the clouds the night of September 22. The Moon is reaching an especially bright Full phase. 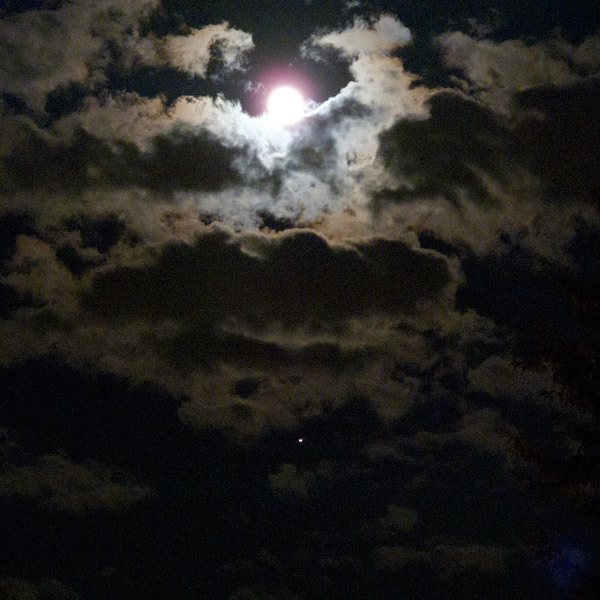 Nearby, shining through a hole in the moonlit clouds, planet Jupiter floats at opposition. This is the sight that greeted me as I left the office tonight and walked to my car. I quickly pulled my little camera from its case and, handheld, captured the scene as best I could; a dream sky. Later: I happened across a beautiful and appropriate haiku at My Haiku World. Pictures you shoot quickly, scenes seized from life, have an authenticity and an emotion that other photos, more polished, technically better don’t have and will never have. I like very much this picture. That is an outstanding photo! Wow!